Doors Hostel has the greatest hostel garden in Bucharest as well as cozy cheerful rooms where you'll feel young no matter your age. 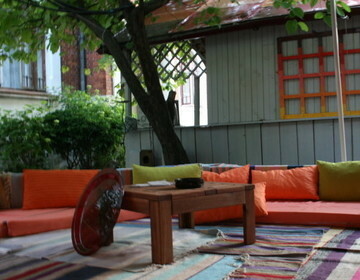 Cultural events usually happens there, Doors Hostel has also its own Teahouse - Ceainaria Cinci. Close to Unirii Sq., situated in an oasis of quiet in the old part of town, where you can glance at the stylish architecture of the 19th century and some of the most beatuful churches in Europe. Bucharest Tips team has reviewd Doors Hostel - Hostels in Bucharest. You can get here description, reviews, address, map, phone, website of Doors Hostel in Bucharest. Visit Buchareset Tips for more Hostels in Bucharest!